Every ProSlice Geometric preset includes visual on-screen controls that allow users to change each panel layout and direction in real-time. Lighting scenarios can also be modified by activating the light guides, allowing users to change the shadow direction each and every time. 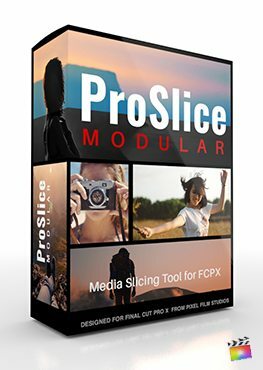 ProSlice Geometric consists of 30 different titles to select from, that are simply applied on the timeline above each media clip. Each ProSlice Geometric layer can be stretched to any duration, accommodating any length of media applied to the timeline. 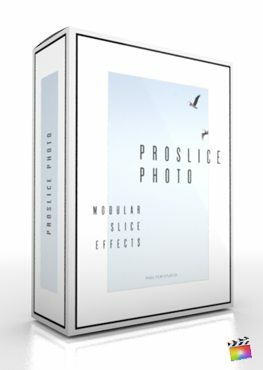 ProSlice Geometric was professionally designed to work seemlessly with Final Cut Pro X. Use the on-screen controls in the viewer to move, rotate, and scale your clips inside their designated areas. It doesn’t get any quicker or easier for even the novice film editors. Where do I find ProSlice Geometric? Once the installation is complete, you can find ProSlice Geometric in the FCPX Titles library.